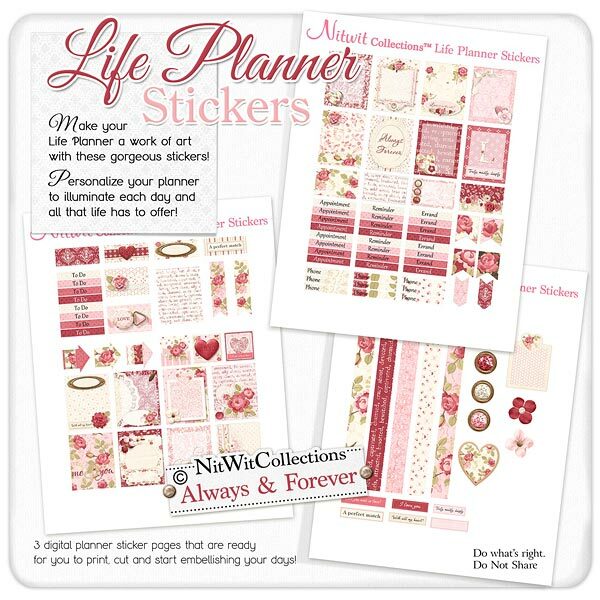 "Always & Forever" Life Planner Stickers give your planner pages the feel of Love!! Whether it be for February's Valentine's Day month or whichever month you're feeling the love....this is the life planner sticker set for you! 2 - Arrow elements to place in to highlight a day, event or more. Now which day would this suit?? 2 - Floral strips that would make excellent bookmarks, area dividers and so much more! 5 - 7.25" long digital washi tape like elements for upper or lower page banners....or down the side, or, or, or! Where do these take your creativity?? 1 - Red metal-looking heart with "hugs and kisses"
3 - Brads with brilliant, sparkling centres. Make your life planner pages shine with these! 1 - Heart-topped journal square...perfect for love notes perhaps? ?